I thought the review was optional? Anyway, title. Woot!!! I love checking in with this app daily. I will say that it seems to highlight more kids games than I would like but almost every week I find a good app. Great app it gives me a chance to try apps I would never haver thought to try before thanks. Great app, I have told many of my friends of this gray app, even friends in Mexico . Found so many great games and apps for free. Lots i never would have tried. Great app thanks. No negatives. Great app, check it daily. If you missed a day, some apps stay free a bit longer! Not what it’s cracked up to be! I have been using this app for as long as I can remember and always found it very beneficial. But over the last many months, it’s become of little use and benefit. What is totally free is getting less and less. Of late most “free” are not really free BUT are “upgradeable” to Pro versions for a cost! The question then becomes, why do I need this App? Just use the App Store. My other beefs are: app repeats seemingly all the time now and the majority of titles offered are for “little folk” with not much for adults. Lastly, there are many FREE apps that are NEVER spotlighted in this app leading me to believe it’s become pay for advertising and not that the devs are seeking real free apps that are beneficial for users. I love checking this app every day to see what great free apps they’re offering. They offer a wide variety of apps for all ages, kids to adults: organizing apps, learning apps, games, photography, etc.! I have been able to try several new apps that are very useful. I really appreciate the work these people do to bring us these free apps! Love this gem of an app. It’s exactly what I was looking for. Thank u!! I’ll keep this review simple. This app gives users a daily list of apps that cost money, that are listed for free for a period of time. How does this work? Sometimes developers decide to give out their app for free on the App Store for a short period of time to boost up downloads. All this app does is alert you when they do this. 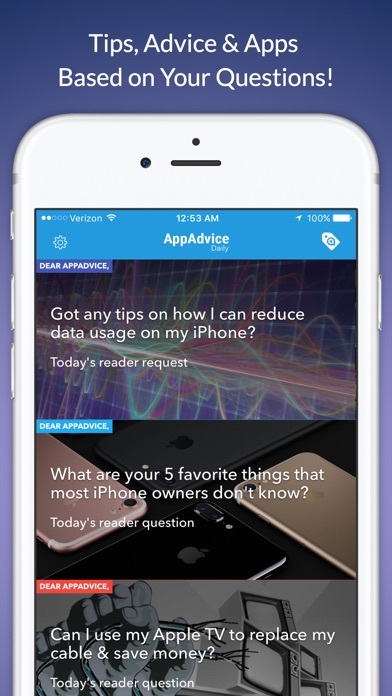 There is also more to this app like articles to read about apps! Nothing to complain about. No updates since several days. Please fix and upgrade. This is a good app but they don’t make selections of different types of apps very good. It would be nice if they made options more selective to the type of programs that you use such as if you play hidden object games, they have hidden object games. Instead of just having free games for children between the ages of five and eight. A well made and dependable app that provides exactly what it says! And I can't say that about many other apps! A pleasant diversion and I recommend highly! Are use this with my grandchildren. They want to get a free game they have to get a free education app also. I've tried out quite a few of the apps suggested. I couldn't be happier this year, as several of the free apps with pro level features were right on target for me...timing wise and feature wise. Thank you!! Doesn’t get better than this. I’ve gotten apps that would have cost me over $50 for free. Generally, you even get the pro app. Good app to have if you have a variety of interests. I had this problem for a week every time I click on an AppStore link in the app it’s redirect me to safari and open an MSN site with foreign language. I never had problems with the app before and I use it every day. Hard to read. Why white text overlaying a pastel background? Somewhere else, gray text on black. Also, why the screen is not expandable? The text is small and not easily read. 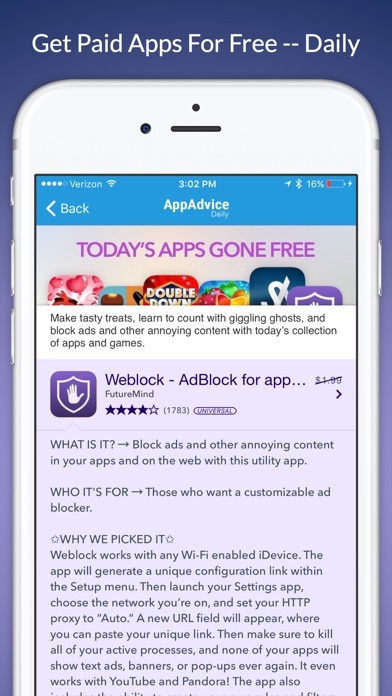 Each day, you never know what hidden gem AppAdvice might bring you. 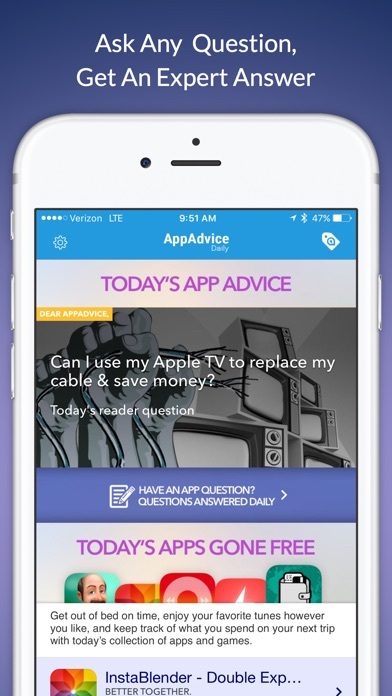 The app itself is free, and it links to a good collection of free apps each day. A great way for new or experienced iOS device users to build up there app collection. 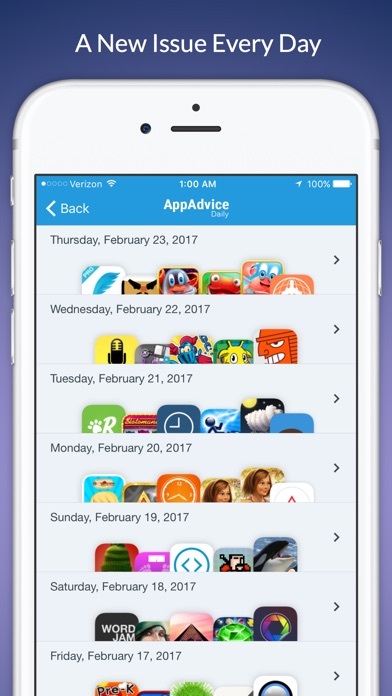 There’s also the advice section which might help you find the best app in a category for your needs. An app I reference every day. I’m addicted to the variety and descriptions. Always there, everyday, with new offerings. And I appreciate their descriptions. Look forward to checking it everyday!! Have found many useful apps to save! Used it for years, but now apps want credit card information for a purchase in ITunes ! I love this app. You get to read answers submitted by other people to learn more. I love the ability to download apps for free and find apps you didn’t know about before. I look forward every day to discovering apps I didn’t know existed or I needed! The variety is awesome! Some apps are totally useless, even being rated 2-3 stars but constantly suggested. Some apps are already expired but still appear on the list. This app crashes and freezes sometimes. A look inside the App. Insight into what it’s about and more. Absolutely❤️love❤️this free app. I literally open this App every single day. Each day they feature 4-6 apps that are free for a limited time and/or free apps with a limited time unlock feature. I’ve downloaded so many new apps for free, that I typically wouldn’t have even thought of searching for in the App Store. Another thing that I absolutely❤️love❤️about this app is the vast range of all different types of genres that they offer. There are apps for kids, gamers, teachers, techs, world travelers, etc. Wooo Hooooo! Looks great! Thank you! This app is great! I only wish they would offer more apps that were blind friendly. I love this app!!! Money in your pockets, free games for kids, better productivity. I love this app, I have found so many new programs I never knew I needed, anything from productivity to device connectivity to games and music. It has it all and every day is different! Definitely worth it! The ONLY place I get ALL my apps. Simply AMAZING! 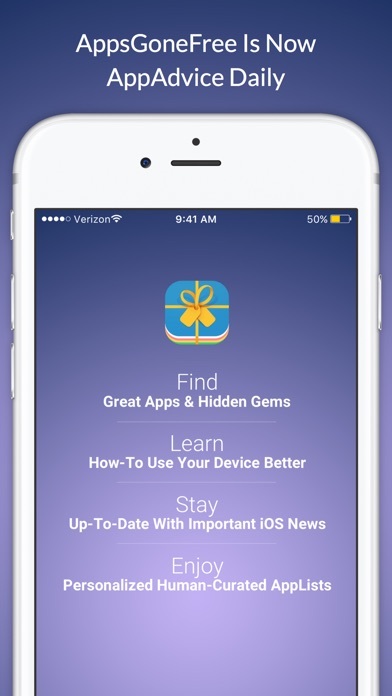 Everyday’s a holiday and App Advice Daily delivers a delightful array of gifts for the celebration! I will never download another app from this site. When my iPhone did the last update, the third party app I got from this site called "wallet" was no longer available in the App Store and could not be updated. I lost every website, login, password and account number I had stored in that wallet. It's been a month and I still have not recovered the information I lost. I will not be using this site again and will not be recommending it to anyone. This app has helped me to discover so many new apps with the added benefit of them all being free! I honestly use it everyday. I love the simple explanation of whether the app is for you plus the tagging of apps (“universal”, “act fast”, etc.). The descriptions are also a nice touch. I’m not interested in games wish you had a selection of what stuff I was interested in. This used to be an awesome app. But over the past several months This app has gone downhill. I have had this app for over three years now and it used to offer really good, expensive apps. .99 Sliding puzzles??? I've gotten $20-$30 apps from apps gone free on multiple occasions and their criteria that determines what apps make the list weed out most cheesy, cheap apps. It's definitely one of my favorite apps and It's nice to look forward to paid apps gone free once a day, everyday. I'd recommend anyone download this app as everyone could benefit from it. Enjoyed the old App donor like the new version!!! This is great if you are a child or have children. If not, it's mostly an endless parade of "Toogie Learns Fish Names"-type titles. The thing is, every once in a while they have some really good apps for free that are very useful/fun for adults and adolescents and you can save big bucks and get special free one-day deals on in-app purchases. So it's easy to get lulled into not opening it by the overwhelming balance of "Winky Wacks Worms" types (the focus on children's apps was not how Apps Gone Free started at all, and it is a letdown), but if you do you might miss something great. I don't like the new format. I keep the old one on my iPhone, the new one on my iPad. What's really hysterical about this is that it seems no matter how early you open it, there's already an offer that has already expired.😂😂😂 Usually a real good one, too. Webpage seems to work but app shows nothing except the settings and bump. From the title it says it all. Give the kids their own APP Advice and us older folks the good stuff. Thanks! Saw this recommended in the comments of Apple support thread discussing the sudden disappearance of Apple’s Free App of the Week. Great replacement. 10/17/2017 Great app I’ve used since I 1st got My iPod Touch 5 almost 6 years ago... Over the years they’ve had great apps featured. 1 of my favorite things they tend to do is feature a bunch of kid friendly learning apps especially during the regular school year. Apps gone free is cool, I like it a lot! This is a really cool app. I enjoy every day getting to see what app has it gone free. Free information for how to get free apps, what could be better! Also it's quick and easy and not complicated, I love it!